We LOVE pets at Little Valley Mountain Resort! Bring your dog to experience Little Valley. Your furry friends can run and play in the great outdoors. 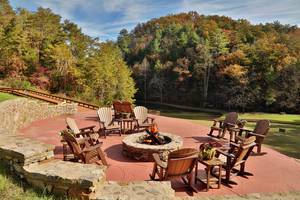 They are welcome to fish, golf and hike along with you as you enjoy all of the amenities here at Little Valley Mountain Resort. Click the link to view a list of the most pet friendly cabins in Pigeon Forge! In the Spring, Summer, and Fall, we open our pool and keep it heated for use even during the more mild times. As long as the outside temperature stays above 65 degrees, the pool temperature stays perfect enough to swim in. The pool is for use by our guests only, so there are many opportunities to have it all to yourself. 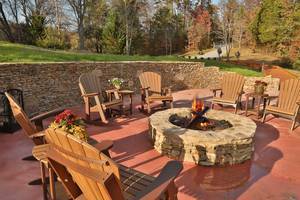 If you have a large group on a Smoky Mountain vacation, this is a great way to spend some time in the sun together, too. Enjoy our 9 hole, par three golf course that is on-site at Little Valley! Enjoy our 9-hole, par three golf course that is on-site at Little Valley! Perfect your backswing just a few steps from your own private cabin. Little Valley offers an 18 Hole Mini-Golf Course available free to our guests. Our Mini-Golf Course is located in our main valley area where you can also find some terrific picnic areas that we have set up for you to enjoy those perfect weather lunches, or for just an easy way to enjoy a meal outdoors. Enjoy the mountain air and the beautiful sunshine on your own little picnic excursion. Tables have been set up around Little Valley for the perfect atmosphere for Turkey Sandwiches and Egg Salad. Why spend money on greasy fast food when you can nibble on your own creations only a short distance from your cabin rental in Gatlinburg TN. Little Valley Mountain Resort offers our guests Four-Stocked Fishing Ponds for a relaxing day amongst nature. We are located on Private Property, so there are no licenses required. You just have to have a desire to slow down while the rest of the world keeps struggling to keep up. We supply the rods and the tackle, all free of charge. Please note that all fishing at Little Valley Resort is catch and release only. We offer our guests two playgrounds for kids to enjoy. One is located behind the main fishing pond, the second is located next to our miniature golf course. Our beautiful new clubhouse is available to our guests for a family or group gathering. Little Valley's Clubhouse features a spacious area for a wedding reception or large family reunion, or entertain your guest outside on the large deck. The clubhouse does require advance reservations, so please let our office staff know of the dates you wish to reserve. Click here for wedding packages. SMOKY MOUNTAIN GROCERY WILL DELIVER YOUR FOOD! Skip the drive to the store and instead drive to the mountains. We'll take care of the rest. Grocery shopping made easy! Now offering Pre-Arrival service. Call ahead to have your kitchen stocked before you arrive! Enjoy horseback riding in the Great Smoky Mountains with Davy Crocket Riding Stables.